Is it the most wonderful time of the year? Well, my favorite holiday is Halloween, but I do love decorating the Christmas tree and Bandit likes to chew the cardboard ornament boxes. Look at that Bandit, he's so dapper! Like I mentioned in my last post, I grew up with dusty, yucky old fake trees, so now I always buy a real one! 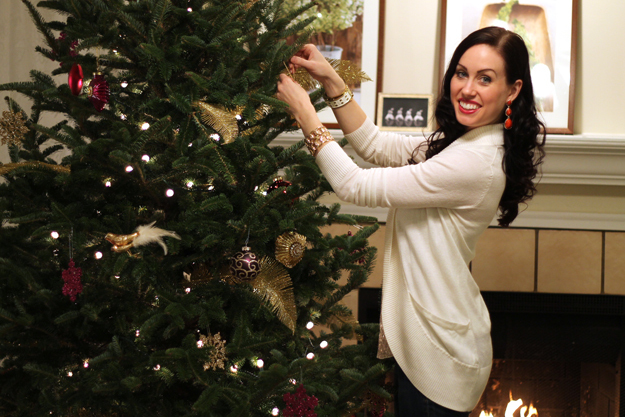 Have you decorated your tree yet? What colors? Just beautiful. And Bandit is adorable! Fake tree wasn't that bad, was it? wow, so festive. and your rabbit!!!! soooo cute. nice! the tree looks beautiful! i haven't even thought about what tree i am going to get...but i do know that i prefer real trees, they make the house smell wonderful. Your decorations are picture perfect. These photos belong in an upscale magazine. Gorgeous pictures. In Italy at home we decorate just before christmas!! You look very pretty in this post and those shoes....SISTER!!!! To die for! Don't laugh....I have a 4 ft prelit tree :) Heck...I live in a condo so it's hopefully acceptable! Gorgeous pics! You look perfect! absolutely love these photos---gorgeous!!! your tree is beautiful! Love the look it is very holiday glam! wonderful! you are so pretty! 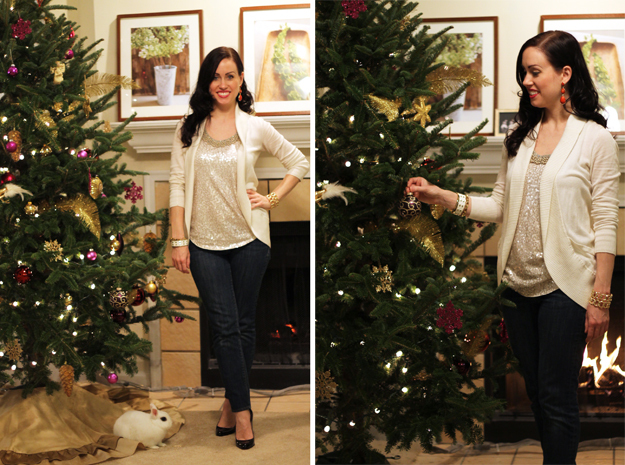 love this look, the tree and of course the cute rabbit! have you seen my blog before? have you seen my new DIY? 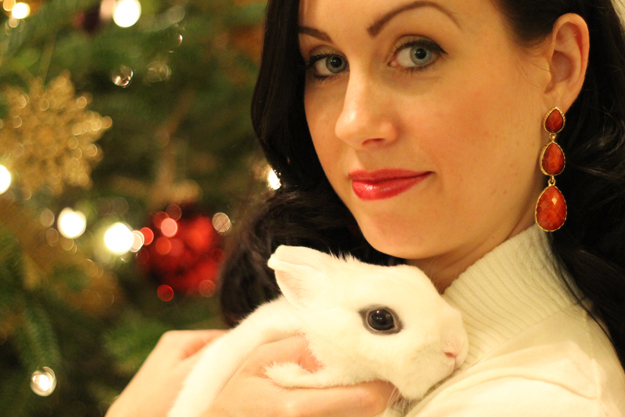 shoe+bunny photo is so holiday! Normally we decorate the day after Thanksgiving, but we've been busy! We chopped down our tree yesterday and will decorate it today! And I'm kind of jealous that you have a white bunny. And that tank top. So sweet. You look adorable. You look really cute! .. and your bunny is ADORABLE! What kind is that? So cute! What a cute outfit for decking the halls! I'm usually in my sweats, but you've got me inspired! You are unbeliveably and classically gorgeous! And that outfit looks pretty classy & chic, too! Love the detail shots, you look so stunning and old Hollywood, love it! love this post! so cute and festive! That shoe shot with your bunny is adorbs!! Can't tell which one I'm lusting more for...the furry or your Loubs! Both for Xmas sounds like a plan...great pics! Your earrings are beautiful. The shade of red really stands out! eek! so cute and the bunnnnyyyyyy!!! You look like you're in an ad for how to create the perfect Christmas tree. Gorgeous! I found your blog when we were both featured on IFB links this week (because we're awesome)! I'm a new follower. I'd love if you'd stop by my blog some time and say hi, and follow back if you're interested! This makes me want to dress up and decorate the tree everyday! Thanks for sharing! Ah, the bunny is adorable! You're so lucky your bunny allows you to hug him. sweet rubbit and you look great. The bunny is truly so dapper! It's a fact, hahaha! Love the shoes & the glittery outfit w/ the white blazer!